Running Nmap on Windows is not as difficult or problematic as it was in the past. Nmap is supported on Windows 7 and higher with performance close to if not quite as good as Linux based operating systems. The majority of users still do use *nix based systems however a good number of people use it on Windows. By installing Nmap on your Windows based systems you have access to the worlds best port scanner for security testing and troubleshooting of network connectivity. In addition you have ncat available a full featured version of netcat a virtual swiss army knife for networks. I am a big fan of ncat and encourage any system administrator or techie to explore the options. To install the Windows version of Nmap simply download the executable installer and click through the wizard. It is your standard Next | Next | Next | finish... all done. By default the Nmap installation directory will be added to the system path. With Nmap in your system path you are able to run nmap or ncat from any command window. If you would like to install from the zip file, there are a few additional configuration items you will have to be aware of and apply. These are all documented on the nmap installation page for Windows. During a default installation of the Nmap Windows package the installation path will be added to the system path. So you are able to simply fire up a command prompt, and launch nmap. If you installed from the standalone zip file you will need to add the installation folder to the system path manually, through system properties. As you can see the familiar Nmap command options appear after running the command. Access to the Nmap NSE scripts is available as are all the standard options. Zenmap is an excellent GUI front-end to the Nmap core scanning engine. It has some pretty nifty features that are not available with the command line version, in particular the network topology map. This rivals commercial mapping tools that perform a similar function and is a nice feature. It is also intuitive to browse through results from different hosts using Zenmap, there are options to save the results in standard Nmap format (.nmap) or as XML (.xml) for further processing. There does not appear to be the option to save in the standard Grep format (-oG). 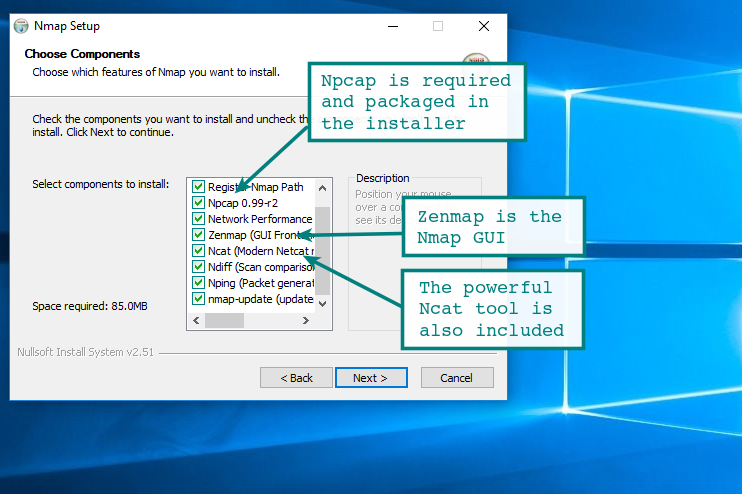 Zenmap is available on Windows and Linux distributions, it can be a great introduction for those less familiar with the command line. Bundled with Nmap are addon scripts that perform all manner of functionality. Of note to those in a Windows environment are the 34 smb- scripts that are available. These allow enumeration of entities on Windows systems remotely using the Microsoft SMB protocol (port 445). Examples include smb-os-discovery, smb-enum-users and smb-brute. There are also vulnerability detection scripts, for testing even the most recent high profile Windows vulnerabilities. Head over to the Nmap NSE scripts page for all the documentation and a list of the scripts. smb-vuln-ms08-067 Test Microsoft Windows systems for the very popular remote code execution vulnerability known as MS08-067. For years this was the go to exploit when using Metasploit. Note this check is dangerous and it may crash systems. smb-vuln-ms10-054 Detect whether target machines are vulnerable to ms10-054 the SMB remote memory corruption vulnerability. smb-vuln-ms10-061 Attempts to discover whether systems are vulnerable to ms10-061 Printer Spooler vulnerability. smb-vuln-ms17-010 Attempts to detect if a Microsoft SMBv1 server is vulnerable to a remote code execution vulnerability ms17-010. The vulnerability is actively exploited by WannaCry and Petya ransomware and other malware. Having access to both Nmap and ncat when on a Windows system is very convenient and lots of fun. There is an amazing number of tricks that can be done with ncat, whether you are troubleshooting, security testing or just need some network-fu during a penetration test. There are now 588 Nmap NSE scripts, the capabilities that these provide is another bonus for having Nmap installed on your Windows workstation. Using the bundled scripts there are large number of short cuts and tests that can be conducted that might otherwise be difficult without additional software installed. Thanks for reading, we also have a tutorial and cheat sheet for those wanting to discover more about this excellent tool.